Where were you on September 11, 2001? For those of us who watched from a TV screen or computer monitor, the day’s horrible events created ripples that carry to the present day. From their immediate emotional impact, to changes in airline security policy, to basic awareness of the geopolitical climate, the attacks changed the life of the average American in ways both big and small, subtle and obvious. The long-term consequences are even more serious for the many first responders who assisted during and after the attacks. Though it is fair to assume these heroes knew the risks that came with responding to such a chaotic scene — and while first responders did account for over 400 of the 2,996 deaths at Ground Zero — few could predict the scale and scope of the health effects responders would suffer in the aftermath. What Newsweek calls a “second wave” of 9/11-related deaths has become a de facto epidemic in recent years. Ground Zero exposure has been linked to respiratory and digestive illnesses, mental health issues, and numerous cancers, among other ailments. Ground Zero exposure linked to a multitude of illnesses. According to the Newsweek article, as of July 2016, these illnesses and disorders have caused roughly 1,140 additional deaths and the number continues to rise. Some of these “second wave” concerns mirror or magnify health problems for which most first responders find themselves at increased risk regardless of geographical region. Others, such as the World Trade Center cough and hosts of related illnesses, are largely exclusive to responders and others with prolonged Ground Zero exposure. These health problems highlight the hidden risks responders subject themselves to when they don their respective uniforms — and the challenges they sometimes face in proving the link between their symptoms and the workplace conditions in which they operate. 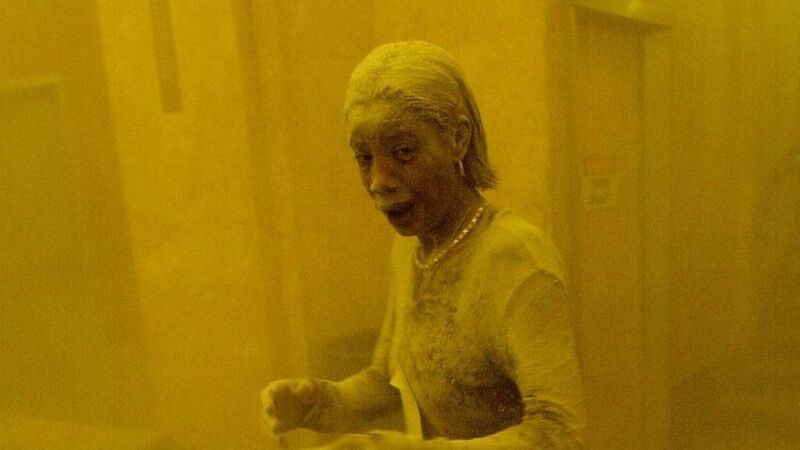 A dust-covered woman glares at a cameraperson, eyes red as blood (Marcy Borders, the woman photographed, came to be known as the Dust Lady; she died in 2015, aged 42 years, from stomach cancer linked to her 9/11 exposure). A red-faced man with his suit covered in a thick layer of soot and grime breathes or coughs into a white handkerchief. Sirens wail as hundreds of civilians and responders jog down a once-busy Manhattan street attempting to escape the stories-tall dust cloud that roils toward them. These are just a few of the lasting images the 9/11 attacks spawned. They all share a common factor: a cloud of dust so thick and ominous you can almost feel your nose burn as you view the pictures and watch the videos. Over sixteen years removed from the attacks, it is clear the dust cloud spawned more than horrific imagery. The thick substance that coated Manhattan after the towers fell was nothing short of toxic. Asbestos levels higher than the Environmental Protection Agency’s threshold for “significant risk” and heavy metals such as lead and mercury were discovered by researchers, as were large, highly-alkaline concrete particles. Research indicates the last item on that list alone, “allowed for deposition in the upper airways,” causing extreme respiratory irritation and possibly contributed to the dust’s lasting effects. The initial dust accounted for only part of the toxic exposure. Yet, the initial dust accounted for only part of the toxic exposure. As Healthline notes: “The enormous mass of debris from the fallen towers […] continued to smolder until mid-December, heating and combining the toxins,” released when the buildings disintegrated. That last point may be of particular concern to responders with ongoing Ground Zero exposure. Per Healthline, nearly 40,000 people suffer health conditions related to exposure, comprising a list of illnesses and disorders whole teams of medical professionals would struggle to treat. Along with the above-mentioned cancers, digestive issues, and respiratory problems, individuals exposed to the World Trade Center’s smoke and debris saw existing conditions like asthma worsen after exposure, while others found themselves at increased risk for immunological issues like rheumatoid arthritis. In all, figures from the World Trade Center Health Program (WTCHP), which provides health services to responders and others suffering post-9/11 health effects, indicate over 65,000 responders with Ground Zero exposure have registered for the program. These responders, many of whom have more than one 9/11-related diagnosis, account for a combined 43,546 certified diseases or disorders, which are illnesses with a proven or statistically significant link to exposure. There are 43,546 certified diseases or disorders accounted to Ground Zero responders. Of the most common conditions faced by 9/11 responders, rhinosinusitis — colloquially known as sinusitis — tops the list, with 21,000-plus responders receiving certification from the WTCHP. It is understandable that someone who spent weeks or months breathing in dust and smoldering toxins would suffer from symptoms like facial pain and pressure, headaches, and nasal obstruction. Other common post-9/11 illnesses require a few more mental leaps. Gastroesophageal reflux disease (GERD), an illness that carries symptoms like heartburn, frequent vomiting, and severe indigestion, is the second most common certified 9/11 illness, with more than 17,000 cases diagnosed. Though these symptoms might seem unrelated to toxic dust inhalation at first glance, the numbers alone suggest an undeniable and sizeable link between the two. In this case, the effects of inhaled toxins on human physiology caused the presence of symptoms. While the physiological processes behind GERD are not yet “fully understood,” according to one WTCHP research paper (PDF), “irritant exposure mechanisms” can cause excessive or harmful “inflammation of mucosal surfaces in the airways and esophagus.” The paper’s authors suspect a dust-induced malfunction of this physiological defense mechanism can ultimately result in GERD symptoms, and that the symptoms should appear shortly after exposure. Supporting this link is the fact that asthma — the third most common certified 9/11 condition — is commonly noted in people who suffer from GERD, and vice-versa. The gastroesophageal condition also has links to high stress levels and PTSD, both of which frequently present in 9/11 responders. According to an August 2016 CNN report, research has linked over 5,400 diagnosed cancer cases to dust inhalation and other 9/11-exposure factors. Perhaps more disturbing, the number of WTCHP cancer enrollments has skyrocketed: where only 1,800 cancer sufferers had signed up for the program as of January 2014, the number of enrollees has more than tripled between then and August 2016, per CNN. Further, the reported number of cancer cases (6,300-plus) exceeds the number of cancer-related enrollments. This suggests many enrollees in the program suffer more than one type of program-recognized cancers. The list of supported cancers is open-ended to some degree, giving leeway to patients who may not fit an otherwise strict definition. For one example, “any cancer that occurs in less than 15 cases per 100,000 persons” annually in the United States is covered under the program. The WTCHP, formed under the Zadroga Act, has not come without its share of political controversy. Most recently, congressional failure to renew the program’s funding drew bipartisan ire from survivors, responders, and the public alike. Congressional failure to renew funding drew bipartisan ire from survivors. Detractors called the circumstances surrounding the events, “more political football,” and, “political squabbling.” Though both parties were ostensibly in support of re-funding the program, disagreements arose over the specific source of that funding, ultimately resulting in Senate leadership removing the authorization to fund it from a transportation bill that was expected to pass. Funding eventually passed in December 2015, this time with a 2090 expiration date, but the horse-trading over what should have been a universally-supported measure left a bad taste in many mouths. In one case, construction workers and first responders in support of the bill were rightfully upset at pointed questions about potential fraud, and were subjected to a continued “moving of the goalposts” by political leadership. Sadly, these events are in some ways a microcosm of the struggles first responders, particularly firefighters, face in receiving fair treatment when faced with work-related illnesses. Firefighters across the country find themselves at increased risk of certain types of cancer, including prostate and bladder cancer. In all, approximately 68 percent of firefighters develop cancer as opposed to 22 percent of the general population. As with 9/11 responders, this is presumably due to aerial toxins released by burning building materials. 68% of firefighters develop cancer as opposed to 22% of the general population. Even with these numbers, however, it can be hard on paper to draw a definitive link between work-related conditions and development of cancer. Because of this, some states have enacted “presumptive” compensation and treatment laws, which — true to the name — presume certain cancers firefighters develop are inherent workplace hazards. As with the WTCHP, securing funding for these laws can stir political controversy. Some states without presumptive laws effectively force firefighters to link cancer developments to “specific fire sites” to receive coverage, according to The Atlantic. Per the same article, this inflexible treatment has caused firefighters in non-presumptive states to use specialized smartphone apps, which allow them to track their exposure to various conditions throughout their careers. For the first responders tasked with saving lives and keeping order in the minutes, days, and months following 9/11, the ripples caused by the attacks are both general and highly personal. They must live in the political climate engendered by the events and deal with prolonged health issues directly related to the attacks. Moreover, while the continued funding of the WTCHP is undoubtedly a large victory, it is also a grim reminder of the illnesses they now suffer; the program would not be necessary if responders were not made ill by the conditions in which they work. First responders are tasked with saving lives and dealing with prolonged health issues. Of course, these events are also a reminder of the hidden risks inherent to the larger first response world. While anyone can imagine the immediate danger a responder might face stepping into an active crime scene or fire, the long-term risks pose threats just as big, if not bigger. At the federal and state levels, the best thing we can do is ensure these responders receive appropriate treatment when workplace conditions cause long-term life-threatening conditions — without political infighting, and even when a certain level of presumption is required.